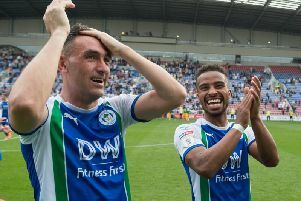 Paul Cook has held up Reece James as the benchmark for how every young player should be after the on-loan Chelsea starlet opened his goalscoring account for Wigan Athletic against Leeds. The 18-year-old – who hadn’t played a senior game of football prior to his arrival in the summer on a season-long loan – has been a model of consistency in making the Latics right-back spot his own. And he marked another fine man-of-the-match display against Leeds with his first ever senior goal, a wonderful 30-yard free-kick that flew into the corner of the net. Cook has already predicted James will become a regular England international before too long, and the Latics boss admits he’s running out of superlatives to describe the precocious youngster. “Reece has been excellent for us since he’s been here,” Cook told the Wigan Post. It was a special day all round for the James family, with Reece’s 17-year-old sister Lauren scoring for Manchester United Ladies in their 4-1 victory over Tottenham Hotspur Ladies. However, Cook – a Liverpool fanatic – was rather less keen to hail that side of the achievement. “That absolutely does nothing for my day, knowing Manchester United have done anything good!” he grimaced. Cook also had little in the way of positives to report concerning Nick Powell, who missed the game against Leeds with a leg injury. When asked whether Powell had been close to making it, Cook replied: “It doesn’t matter how close Nick was to playing, because he never played! “But I wouldn’t have said he was close to playing, no. “We’ll wait and see with regards to next weekend, but these are the things that go against you. Cook was also reminded of the phrase ‘it never rains but it pours’ when it was pointed out Sam Morsy’s fifth booking of the season will keep him out of next weekend’s tough trip to Middlesbrough. “It can’t rain forever...but we’ve got Middlesbrough away next weekend, and it might still be raining then,” added Cook.